Dating back to the early 20th century, this honorable holiday is one of the most reverent days in the United States. 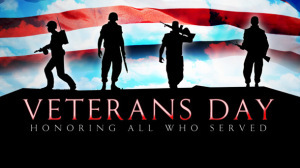 Veterans Day is especially important now, due to the declining number of living veterans from World War I. Many Americans have grandparents who remember the end of the Great War, but few have great grandparents who were actually old enough to serve in the war. Although the holiday originated for World War I, it is now celebrated to include all veterans of wars, conflicts and active duty service. In the United States, the armed service community is very tight, and the army, navy, air force, National Guard and reserves of the US have been very important in shaping the country as well as the entire world. Gallery | This entry was posted in My Entries. Bookmark the permalink. Honoring those you admire and thank – great job Christine! Sorry about that, but I’m basically computer illiterate and could not even venture a guess as to why it gave you trouble! haha – I’m over-the-hill I suppose. We’ll have ask a 10-year old for help. Very nice! So sorry I am way behind!